XML Sitemap Generator is my favorite Plugins. This plugins will increase your blog by added sime xml sitemap with easy step. 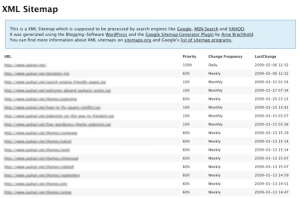 Why you need XML Sitemap? Like we all know,Â The XML-Sitemap format was introduced in 2005 by Google and adopted in 2006 by YAHOO, MSN Search and Ask.com so thats why itâ€™s often called “Google Sitemaps”. So with this tiny plugin you can get more better visitor, because Search Engine will enjoy you sitemap.